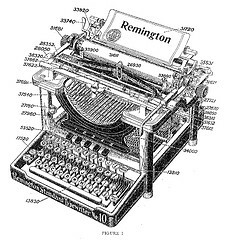 Old typewriters are pretty cool, but did you ever try adding footnotes to a paper using one? Not so easily done. Thank goodness for modern innovations! In my last Library Hacks post, I introduced Zotero and Mendeley, two free “reference managers” that help you collect and store all kinds of materials – from PDF files to book citations to webpages – in your own online library. Now we’ll look at how these same tools can help you add footnotes, citations and bibliographies to a paper as you’re writing it. And it’s a snap!